"The voice of this well sustained and consistently strong collection is unusually urban. Cosmopolitan in the real sense of the word; its strength is in its landscape and structure. Starting with a variant of the Shipping News and weaving through locations like Athlone; Connolly Station, Dublin; Berlin, and Russia, the writer shows his ability to make each place his own as he brings the reader through his multi-faceted world of imagination and place." Alan Jude Moore was born in Dublin in 1973. He currently lives in Moscow. His poetry has been published in numerous publications in Ireland, the UK and the USA, including Poetry Ireland Review, The Stinging Fly, The Burning Bush, Books Ireland, Ropes, Force 10, The New Writer and Kestrel. He was short-listed in 1999 for fiction in the New Irish Writing / Hennessy Literary Awards. He took part in the Poetry Ireland Introductions readings in Dublin in 2001. Black State Cars was the recipient of a Salmon Poetry Publication Prize for a first collection. a carton of milk goes off. as does your trouser leg. Thematically prominent right through this striking debut volume are the unsuccessful, uglifying ways we intrude on our natural surroundings, and the disastrous perversity inherrent in romantic love. It might easily be said these fifty poems exemplify something of a dystopian vision, but if so it is really a dystopia of the senses and sentiments, formed from the gradual, agonising realisation that, from everyday considertaions, one must outwardly forego one's poetic ideals while labouring to preserve within oneself their individual meaning or value. Presumably on grounds connected with this attitude, Moore has been called an 'urban' poet, but this tends to oversimplify. What he expresses represents a robust rejection of the urban at its ugliest, emptiest, most feeble and enfeebling. But things are hardly better in the her and now, where: 'The road and river look old, planted/ beside an automated transportation depot' while nearby horses, that once upon a time had such a dynamic, participatory role in our commonplace dealings, are these days rendered tame, essentially superfluous, and 'stand mouths gaping open'. Moore's images wonderfully point up the paucity of our current condition of 'progress', with all the efficient, denatured blandness that typifies it, a condition underneath which the presences of tradition and nature insistently and indignantly pulsate, even if muted, or seemingly effaced. 'As if it was meant to me/ like this long ago,' the poet parenthetically laments. 'Connolly' is another bitterly valedictory poem whose account of frustration, discontent, and disappointment is once more expressionistically built up out of neatly itemised observations that culminate in the pain of suspicious resentment caused by the prospect of one's significant other blooming radically during a period of separation; meanwhile, one is left with the wish that one's bitterness will simply transform into something riper, more serene: 'she will rise through the Summer/ while you wait for insects to change into flowers'. Through its seemingly random, oppressively austere imagery, ('Feathers in the drain cling/ to the shadows of small dead birds' ... 'The back of the city breathes/ the police helicopter light') this poem captures with a tender-tough acuteness the emotional drabness of unresolved parting. 'The Scavengers', in subtly revealing how carnal longing may bring out a shady, clinging predatoriness, where we uglily objectify others and approach them in the coldly tactical manner ('he maps a course of action across her skin;/ tied to the secret operation of his need'), is an objective meditation on the opportunities for evil which desire opens up -- a psychological realm this particular poet is notably stimulated by. Like all true poets, Alan Jude Moore is galvanised into urgent poetic utterance by everything that strikes upon his highly tuned sensitivity. His is a precise, energetic, inclusive vision, married to an excellent sureness and spontaneity of voice. 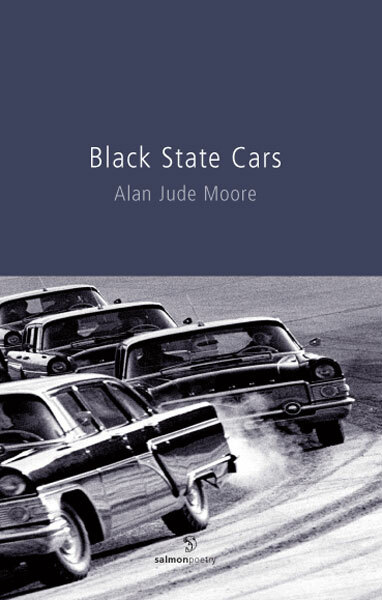 Black State Cars (published -- deservedly -- via the Salmon Poetry Publication Prize) demonstrates both how devotedly and scrupulously Moore controls his profound emotions in the interests of authentic poetic expression, and his power in channelling those very emotions with an understanding and refinement that is both imposingly faithful and memorably elegiac. I recommend this collection unreservedly.